Baillargeon, Denyse . "Irma Le Vasseur". The Canadian Encyclopedia, 17 January 2018, Historica Canada. https://www.thecanadianencyclopedia.ca/en/article/irma-le-vasseur. Accessed 24 April 2019. 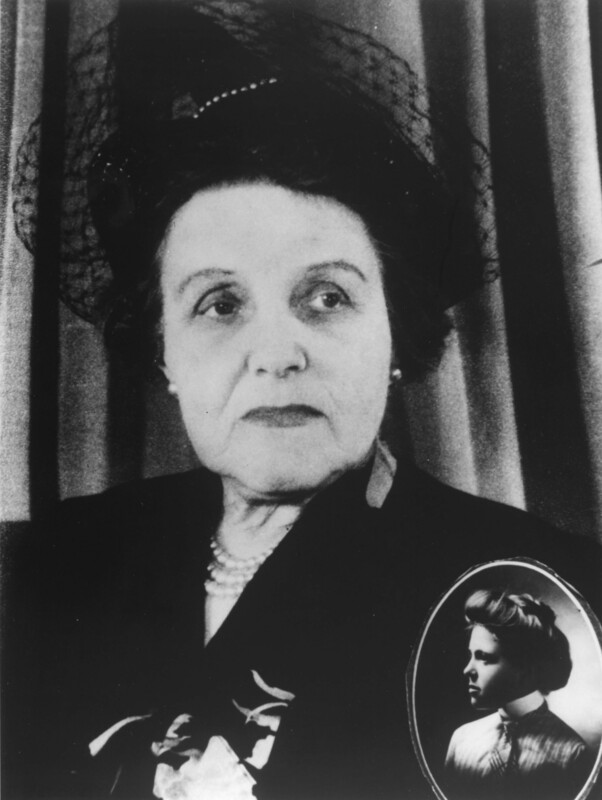 Irma Le Vasseur, MD, first French-Canadian female doctor and founder of the Hôpital Sainte-Justine in Montréal and the Hôpital de l’Enfant-Jésus in Québec City (born 20 January 1877 in Québec, QC; died 18 January 1964 in Québec, QC.) Dr. Le Vasseur was one of the very few female doctors of her era and was a pioneer in pediatric medicine. She devoted her life to sick children, founding major institutions that continued her work after her death. Born in Québec City, Irma Le Vasseur was one of four children and the only daughter of the singer Phédora Venner and Nazaire Le Vasseur, a journalist, public servant, musician and writer. Irma attended the Couvent Jésus-Marie in Sillery and the École normale Laval, a teachers’ college. She enrolled in the School of Medicine at Minnesota’s Saint Paul University in 1894 and graduated in June 1900. Possible reasons for her enrollment include the early deaths of her brothers and the abrupt end to her father’s medical studies due to financial difficulties. She practiced in New York for some time, notably with Dr. Mary Putnam Jacobi (1842–1906), one of the first women to be admitted to the École de médecine de Paris, before returning to Québec. There, she petitioned the National Assembly to pass a private member’s bill entitling her to practise medicine in her home province. On 25 April 1903, she became the twelfth woman in Québec and the first French-Canadian woman to gain this right. She was one of very few to have studied outside the province; most of her female peers studied at the Bishop’s University Faculty of Medicine, the only medical school that accepted female students at the turn of the 20th century. Soon after she earned the right to practise, Dr. Le Vasseur left for Paris and Germany to specialize in pediatrics. In Paris, she worked closely with Dr. Madeleine Brès, the first Frenchwoman to practice medicine and a renowned pediatrician. Returning to Québec in 1906, she worked at Montréal’s Crèche de la Miséricorde, which treated children of single mothers, and briefly for the school medical inspection service that Montréal’s public health department had recently set up. Dr. Le Vasseur wanted to play an active role in the fight against the high rates of infant mortality, so she took steps to establish a children’s hospital. In the fall of 1907, she allied herself with other upper-class French-Canadian women in Montréal, such as Justine Lacoste-Beaubien, and several physicians, including Dr. Raoul Masson and Dr. Séverin Lachapelle, to found the Hôpital Sainte-Justine. It was the first French-Canadian pediatric hospital in Québec. She was relievedof her position as director in January 1908 for reasons that remain unclear. She resigned from the medical staff a few months later and left the institution that she had founded. After leaving Sainte-Justine, Dr. Le Vasseur returned to New York, where she worked for the city’s public health department as a medical inspector for schools until April 1915. Then she volunteered to care for victims of a devastating typhoid epidemic that had hit Serbia and killed almost 800,000 people in two years. Several Canadian doctors accompanied her, including the future Québec Minister of Health in the Duplessis cabinet, Dr. Albiny Paquette. In his memoirs, Dr. Paquette praises the courage, determination and unflagging energy of the only woman in the group, who continued her work long after her male colleagues had left. In 1918, she worked in a military hospital in France, and later she moved back to New York to work for the Red Cross. Irma Le Vasseur returned to her hometown for good in 1922 and bought a houseon the Grande-Allée at the current site of Building H of the Québec government’s administration complex. In January 1923, she launched a new children’s hospital at the same location, in collaboration with pediatrician Dr. René Fortier and orthopedic specialist Dr. Édouard Samson. It was called the Hôpital de l’Enfant-Jésus. Once again, disagreements arose between her and the other directors, and she eventually left the institution. In the fall of 1923, the Hôpital de l’Enfant-Jésus moved from the Grande-Allée and Dr. Le Vasseur’s property. In its place, she opened a new institution, the Hôpital des Enfants malades, and she was its only director. The clinic treated mainly children with disabilities, and in late 1924 it moved to a smaller location on Rue de l’Artillerie in the Saint-Jean-Baptiste district. In the early 1930s, Dr. Le Vasseur campaigned for the establishment of a school for children with disabilities. The Ligue de la jeunesse féminine de Québec made her dream a reality in 1935, founding the École Cardinal-Villeneuve, which today forms part of the Institut de réadaptation en déficience physique de Québec. During the Second World War, she examined female recruits for the Canadian Army at the Québec City Armoury; this was apparently her last assignment as a medical practitioner. In 1950, the Québec Cercle des femmes universitaires organized celebrations to honour Irma Le Vasseur’s golden jubilee and all her achievements, but other than this tribute, her many initiatives to help sick children went largely unacknowledged during her lifetime. She became more and more isolated and was a patient of the Roy-Rousseau clinic at the Hôpital Saint-Michel Archange from 1957 to 1958. She died six years later, alone and destitute. Her contribution to children’s medicine was finally acknowledged in the 1980s, with the Mont Irma-LeVasseur in the Charlesbourg district of Québec City, an auditorium at the Hôpital de l’Enfant-Jésus, the Pavillon Irma-LeVasseur at the Cégep François-Xavier Garneau junior college, streets in Québec City and Montréal, a park in Outremont and a scholarship sponsored by the Québec Secrétariat à la condition féminine. In 2009, a sculpture symbolizing her work was erected near the entrance to the local community services centre (CLSC) in the Limoilou district of Québec City. Denyse Baillargeon, Naître, vivre, grandir. Sainte-Justine, 1907-2007 (Montréal: Boréal, 2007). Denyse Baillargeon, Brève histoire des femmes au Québec (Montréal: Boréal, 2012). Irène Brisson, “Nazaire Le Vasseur,” Dictionary of Canadian Biography.